A benchmark guitar that holds its own with the mighty G.
Smart build, neck shape, fretwork and setup with classic sounds to match. 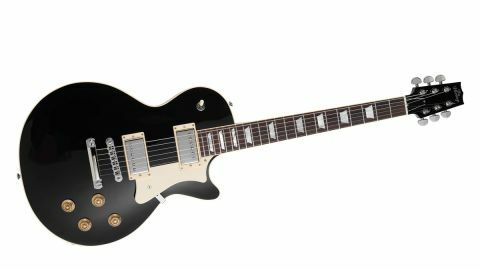 It’s (yet) another close cousin to the Les Paul and might simply be too generic for some. Headstock shape is a little polarising. At various points since 1985, Heritage has provided a very valid alternative to Gibson - building its electric guitars in a purchased space of Gibson’s historic Kalamazoo factory, and, originally, with some key senior ex-Gibson employees on the team. Its guitars have been a rare sight in the UK over the past decade, but new owners in 2016 signified a seemingly revitalised company, and now its streamlined range has proper distribution here, too. Now, as then, it’s that heritage that is the biggest pull for many. Somehow, guitars built in the same location as those of the 50s and 60s classics must be as good, if not better, than the Gibsons themselves. Ironically, at times the almost-ramshackle production facilities and original machinery proved just as variable in terms of quality and consistency as the company Heritage aimed to emulate. Apparently, today - although it’s not advertised by the company - Heritage’s current production includes a Plek machine and has evolved from the more traditional, historic craft of the brand’s prior years. Pulling the H-150 from its case, it’s very clear that Heritage isn’t messing around. This is one very smartly built Les Paul-alike. Obvious changes are the slightly downsized and rounded treble horn, the straight-sided yet very functional headstock, and uniquely shaped pickguard. Get over those features and you’re in for a treat. Of course, its opaque black nitro gloss finish hides any wood identification (and is rather oddly priced the same as the other colours that show off nicely flamed maple tops), although if our H-535 is anything to go by, we’d wager the neck is one-piece mahogany. There’s no mention of any weight relief and it comes in on the heavier but acceptable side at 4.14kg (9.1lb). ‘Nicely done’ pretty well sums up the build of this guitar, not least the neck, which has a very similar width and depth (21.5mm at the 1st fret filling out to 23.7mm at the 12th) with a full, slightly flat-backed C profile. As supplied with a string height of 1.2mm on the treble side and 1.5mm on the bass, and measured at the 12th fret, both are a little too low for us, but the fretwork is immaculate with slight and well-shaped nibs to the fret ends, while the medium-gauge wire is around 2.6mm wide with a low, classic height of a shade over 1mm. The deep, dark rosewood fingerboard has a radius that’s quoted as 305mm (12 inches) like Gibson; the scale length comes in at around 624mm (24.6 inches), slightly shorter than the quoted 629mm (24.75 inches) - again, just like Gibson. Unlike the current slew of 2019 Gibson models, such as the Standard with its hugely expanded wiring, Heritage ploughs an old-school furrow with a pair of industry standard covered and potted Seymour Duncan ’59s on the H-150. There is also a Grover tuner, a TonePros-style die-cast zinc locking stud tailpiece and an aluminium Nashville-style tune-o-matic with titanium saddle and slot-head post caps to lock it firmly in place and made, we believe, by Advanced Plating in the USA. Don’t expect any surprises here. Like the classic build the guitar emulates, it immediately hits the spot, from the crisp ring and vibrancy unplugged, to a neck that feels like many you’ve played before and enjoyed, and a huge sense of overall familiarity. Plugging in, the ’59 humbuckers are certainly at home on this platform with a more contemporary sizzle, while on lower-gained and clean amp voices they have an almost single-coil-like clarity. Setups is superb, not least the beautifully cut Corian nuts. And, to be honest, aside from slightly raising the string heights, we’d take this guitar straight to a gig and not look back. It really does what the tin says - effortlessly. This writer would certainly prefer vintage wiring, but not everyone constantly fiddles with their controls and that’s a quick fix with a soldering iron. The volume, for example, mutes the highs a little too much as you pull back, and the almost generic choice of pickups probably won’t satisfy the true cork-sniffing PAF-ophiles. And while Heritage’s own-design pickups would offer a less generic flavour adding to the allure, there is very little that we couldn’t work with here. If you’re looking for innovation and sonic diversity, you won’t find it here. What you will find, however, is an example of a benchmark guitar that holds its own with the mighty G. How, or indeed where, the instrument is made doesn’t appreciably interest us: it’s the end result that matters and this is an exemplary piece and nicely priced under its major competitor, too. If Heritage can add in consistency and keep its dealer network happy, here’s a brand that we almost lost but could well be on for a rather rosy future. A little vintage-y fairy dust applied to both wouldn’t go amiss, bearing in mind the current obsession of many players to pretend its 1959, but to the majority, this is a 100 per cent fit-for-purpose tool of our trade.